Today I have exciting news. 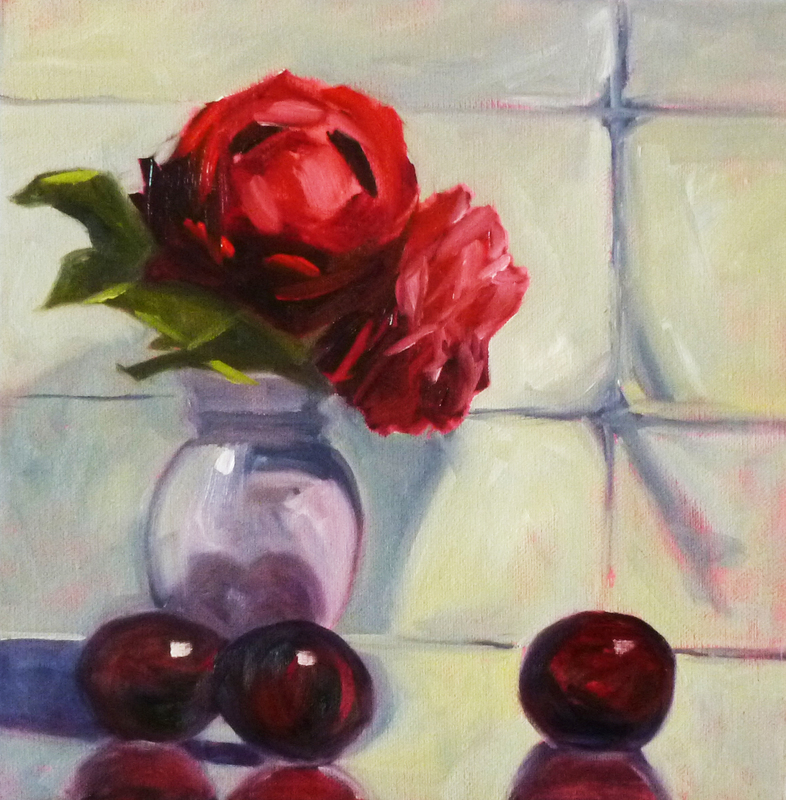 I've joined a wonderful group of painters and added a new selling venue for my art. For quite a while now, I've contemplated joining Daily Paintworks and took the plunge today. If I've clicked all the right buttons, work should be showing up in my Daily Paintworks Gallery tomorrow. In my last posting I mentioned a series of 12x12 inch paintings I'd been working on. This is another from the series. I call it "Against Giants." Both were created on 3/4-inch gallery-wrapped canvases. I plan to have this series entered as some of the first paintings in my Daily Paintworks Gallery. I'll be adding work frequently. For those of you who follow my work at Etsy, I will continue to sell small format paintings at that site, too. 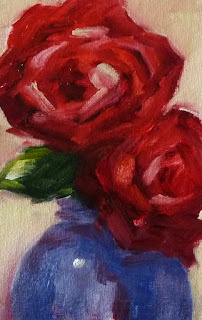 My last posting was a small 4x6 painting of roses from my yard. As I mentioned then, painting roses is somewhat intimidating, but the flowers were so lovely, I took the plunge and chose the subject again. The hardest part was the rose on the right. I wiped it off a couple of times before it finally began to look like the side view I was interested in creating. 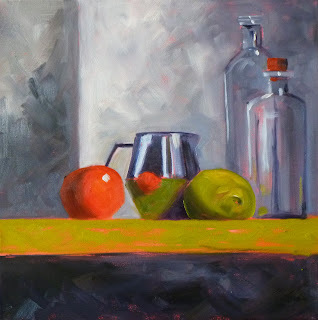 This painting is the third in a series of still life paintings in the 12x12 inch format. I'm enjoying the format. When the paint is dry, it will be ready to hang. Contact me at smallimpressions@hotmail.com if you have questions. These beautiful roses are from my backyard. They are big, full, and very dark red. When my husband brought them in, my first thought was that I should paint them. Then I had second thoughts. Roses are tricky. As I painted I kept telling myself not to over work them and to paint shapes. I'm fairly happy with the results. 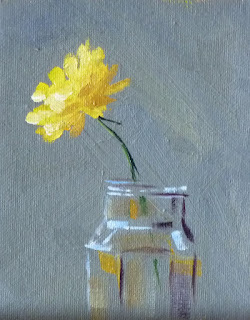 Now that the paint is dry, they have joined the other small format flower painting for sale in my Etsy Shop. 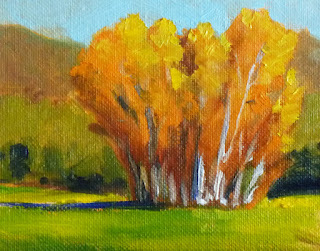 The painting is 4x6 inches on a canvas panel. Click here to purchase or view it in the shop. I love these little flowers; my husband hates them. He's constantly yanking them out of the yard wherever they struggle to gain a toe hold. Luckily for this little blossom, he chose to emerge in the parking down the street. He had free reign to lift his face to the light, but then I clipped his life short so I could paint his portrait. I guess I'm no better than my husband when it comes to the life of a dandelion. The painting is 4x5 inches on a canvas panel. It can be viewed in my Etsy Shop or purchased by clicking here. While the rest of the country cooks, the Northwest is foggy and cool. I've wanted to get outside and paint some sunny landscapes, but everything is gray, damp, and low contrast. So, with the idea of painting outside fading, I created a little 4x5 inch autumnal painting using an orange under painting. I used to use orange as an under painting fairly frequently, but then fell out of the habit. This was just enough sunshine to brighten the gloomy nature of this summer. This painting is for sale in my Etsy shop. Click here to view it in the shop or make a purchase. 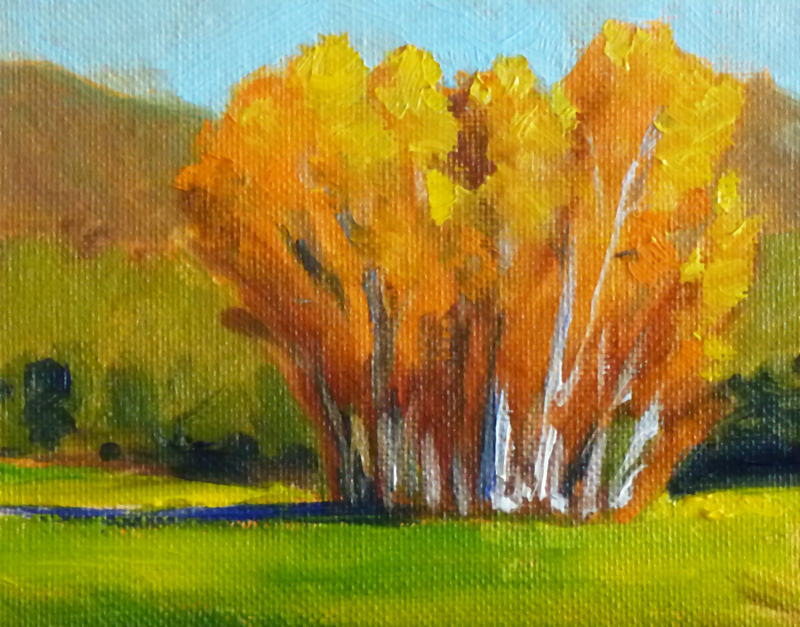 In this little 5x7 inch oil painting, I was working on what I call "The Green Problem." In the Pacific Northwest, we get a lot of rain. It results in several delightful problems. First, landscapes are often a cornucopia of green. It is a big challenge as an artist to keep variety in my paintings with so much green. Second, how do I mix endless greens from just a few colors? This painting was inspired by morning sunshine on the grass along the Dechutes River in Central Oregon. The grass was a brilliant speckling of green, thus a great subject for tackling "The Green Problem." I used two blues and four yellows plus white to create the sun dappled grass and attempt to capture the brilliance of the scene. I'm happy with the results of this little sketch. The next challenge will be to find a composition that will work when scaled up. I'm not sure that this one will work. New dilemma for another day. There are many summer landscape paintings for sale at Fine Art America. My backyard is full of Shasta Daisies. Every summer giant collections enter my house and hope to be painted. Every summer I try to accommodate their request. One thing I've discovered is that when painting white flowers I need to use more grays and neutrals. 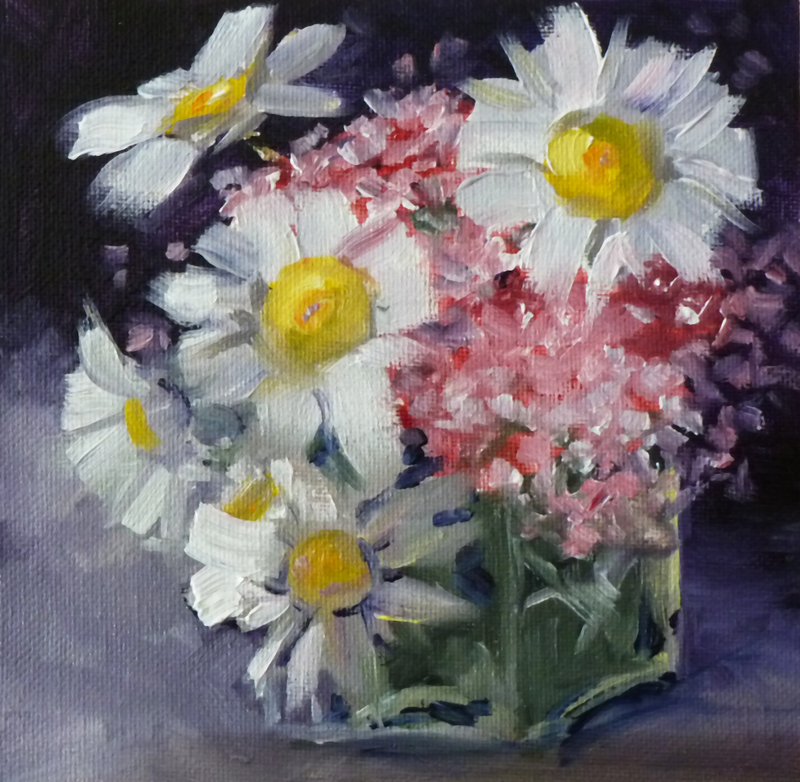 I'm getting better at it and am fairly satisfied with this attempt, but will keep working those elusive white petals. The paint is dry and this one has joined some of my other flower paintings for sale at my Etsy Shop. Click here to view it in the shop or make a purchase. A new produce store recently opened near my house. It is absolutely delightful with plump fruits, vegetables, and a great wine selection, too. 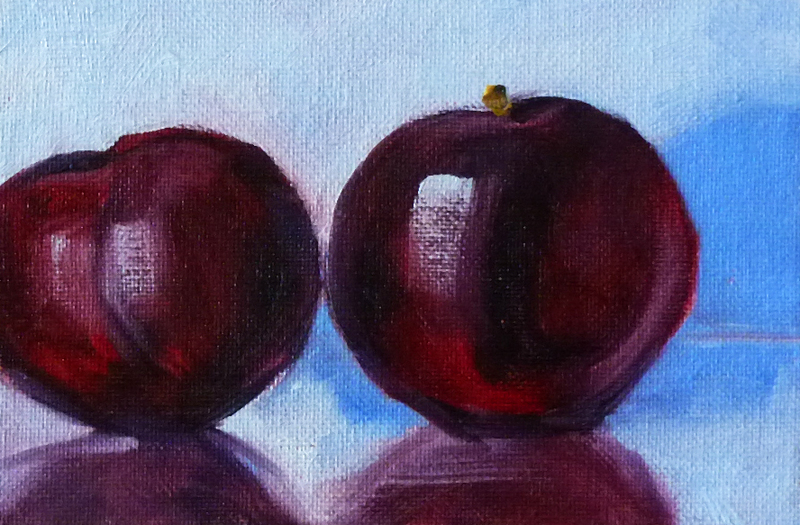 These fat little plums provided inspiration and demanded that I paint their portrait. The painting is 4x6 inches and is for sale at my Etsy Shop along with some of my other small paintings of fruits and vegetables. Click here to view it in the shop or make a purchase. 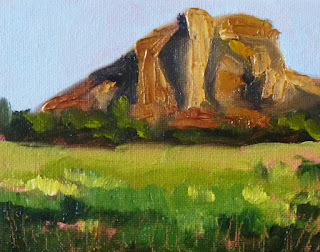 Today's painting is a small 4x6 landscape inspired by a recent visit to Smith Rock in Central Oregon State. I've visited this enchanting place numerous times, but this last time it was around 7 a.m. when the shadows were long and the air was morning crisp. While my daughter ran a 10K race, I snapped pictures and gathered inspiration. If you've never visited this location, it is definitely a place to add to your list. There are trails for hiking, rocks for climbing, roads for biking, and wildlife for viewing. This painting will be listed for sale at my Etsy shop when the paint is dry. 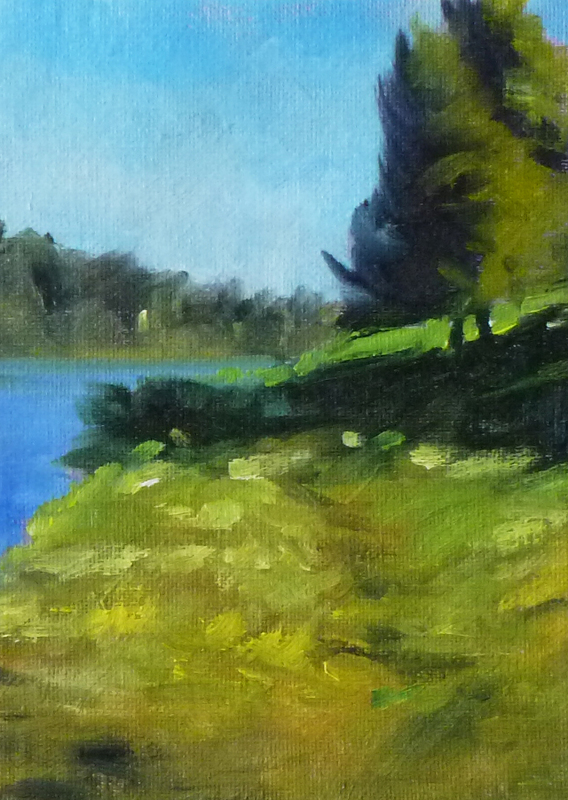 In the meantime, you might want to view some of the other landscape paintings that are for sale in my shop. Check back soon. Check back often.